Here's how to celebrate Pi Day in D-FW. DALLAS — It's Pi Day! No, not the kind of pie you eat, but the mathematical equation. Today is March 14, or 3-14, which is the beginning of the never-ending mathematical constant 3.14. Math lovers everywhere are celebrating the most iconic irrational number. Pi is the ratio of a circle's circumference to its diameter. Spark the stem spirit with your kids at the Pi Day Festival at Sammons Park in Dallas. Students will learn how math impacts the world outside of the classroom from science to art and even nature! The fun starts at 10 a.m.
At Norma's Cafe locations, they're celebrating by giving. A portion of all their pie sales will go toward STEM programs and scholarships in North Texas. 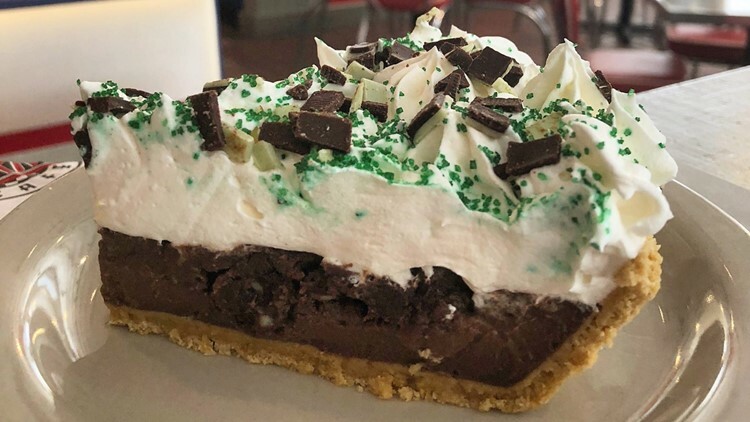 They're also serving up a Mint Chocolate Pie, which portions of sales through March will go to the Millennial Clubs. Take the Pi Day Challenge at Emporium Pies. You'll get a free slice if you can name Pi up to the 20th digit on the first try. At Blaze Pizza, sink your teeth into an 11-inch personal pie for just $3.14. Cane Rosso restaurants are serving up $10 Honey Bastards pizza pies all day. At Your Pie in Frisco, you can celebrate with a 10" pizza pie for $3.14. Humble: Simply Good Pies in Dallas are giving a limited number of coffee mugs away with a purchase of a slice and cup of coffee. At BJ's Restaurant and Brewhouse, get a mini one-topping mini pizza for $3.14. Cici's Pizza is offering a $3.14 buffet deal with purchase of a drink with a coupon. You can get as slice of key lime pie for $3.14 at California Pizza Kitchen. Sign up with Villa Italian Kitchen online and receive a coupon via email for a $3.14 whole pizza. At 7-11, you can get a slice of pizza for 50 cents, and $3.14 for a whole pie throught their 7NOW app. Or stop by the grocery store for a great deal. Kroger stores are also getting into the celebrations with bakery pies for the special Pi Day price of $3.14! Sauce Pizza & Wine offer $3.14 cheese pizzas for guests that dine-in at any of its locations. 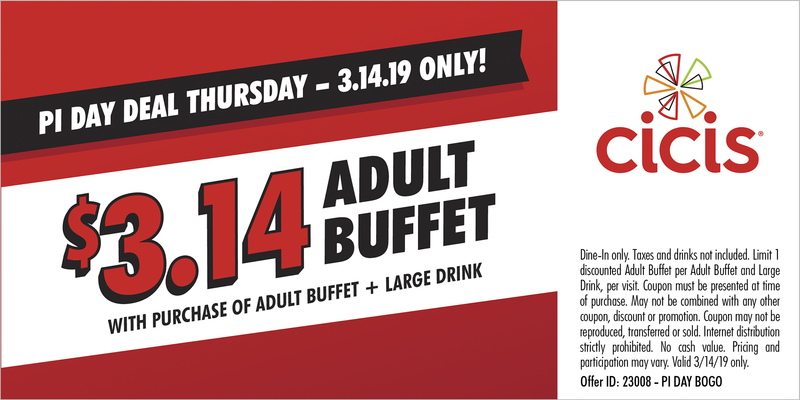 This offer is valid only on March 14, 2019 and is for dine-in guests only. Limit is one per guest per visit. More of a chicken pot pie fan? Cheddar's Scratch Chicken and Boston Market are doing BOGO deals.